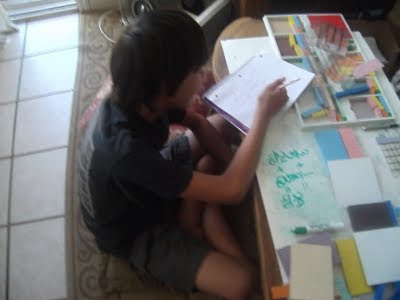 Here is an 11 year old who is just getting started at the house of math. His primary assignment is to work on multiplication. While he is doing that, I expose him to various basic math concepts. He has played in algebra and fractions, and he is seeing that multiplication helps because it allows you count quickly. This gives some motivation to work on his multiplication. I specifically tell him (and his parents) not to just drill on multiplication tables but to play games, listen to music, and generally mix it up so it doesn't become tedious and boring. We also work on addends...addition and multiplication are just ways of counting quickly. We need to be able to count quickly in order to math but math IS NOT computation in and of itself. In just three lessons he has already come a long way. The third lesson is a lesson on fractions if you'd like to see it you need a password and you can find it here (currently at the bottom of the page) called Fractions with Koa. My fractions page needs work, but there is a lot of stuff there and I have a few fractions worksheets for beginners up too. You can download the pdfs and see more vids with a password.